Authors Stephen Goodson and Peter Hitchens should be commended for their honest assessment of history, especially when compared to, say, chief 9/11 myth-maker Philip Zelikow. What is the difference between history and myth? Not much, according to University of Virginia history professor Philip Zelikow. The main author of The 9/11 Commission Report, Zelikow describes himself as “an expert on the creation and maintenance of public myths.” He defines public myths as: “beliefs (1) thought to be true (although not necessarily known with certainty) and (2) shared in common within the relevant political community.” As the fraudulent fabricator of the official story of 9/11—Zelikow wrote the report in chapter outline before the commission had even convened—his job was to make sure that the “bin Laden and 19 young Arabs” myth was seared into the collective consciousness of Americans, so it would be forever “shared within the relevant political community” even though it was a big lie. Zelikow knows that to enshrine a public myth, you need vivid characters, including larger-than-life heroes and villains: “A history’s narrative power is typically linked to how readers relate to the actions of individuals in the history.” That is why textbook history highlights such memorably heroic figures as Winston Churchill, Abraham Lincoln, Woodrow Wilson, and Franklin D. Roosevelt, alongside the dastardly villains Hitler, Mussolini, Robert E. Lee, Muammar Qaddafi, Osama bin Laden, Guy Fawkes, and so on. 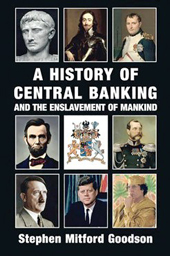 The 2017 third edition of Stephen Mitford Goodson’s A History of Central Banking and the Enslavement of Mankind features many larger-than-life figures on its cover. Lincoln, Hitler, Kennedy, and Qaddafi are pictured side-by-side. But in Goodson’s version of the past 2,500 years, the two canonical villains (Hitler and Qaddafi) like the canonical heroes (Lincoln and Kennedy) all waged heroic struggles against the real villains: the international bankers who are relentlessly degrading humanity, through the diabolical tool of usury, into abject debt slavery.Goodson covers a lot of revisionist history in only 200 pages. Though I thought I knew my political assassinations, A History of Central Banking argues that big bankers have murdered more of their opponents than I had realized: not just Qaddafi, JFK, Lincoln, Charles I, and the Romanovs, but also Julius Caesar, Napoleon, British Prime Minister Spencer Perceval (d. 1812), many heirs and relations of the “Sun King” Louis XIV, President James Garfield, Rep. Louis Thomas McFadden (R-Pa.), and many more. Perhaps the most controversial aspect of A History of Central Banking is its world war revisionism: Much of what we have been taught about World War I and World War II is wrong, beginning with the relative heroism and villainy of various larger-than-life leaders. Goodson argues that both wars were orchestrated by international bankers, and that the people our textbooks call heroes were actually stooges of those bankers, while many of the canonical villains were actually rather noble, at least in their willingness to defy the greatest and most diabolical powers on Earth. Goodson, who died last August, was no conspiracy crank, but the director of the South African Reserve Bank from 2003 to 2012. Like economic hit man John Perkins and International Monetary Fund whistleblower Peter Koenig, Goodson was a banking insider who dared to tell the truth about his monumentally crooked profession. Another author who has rubbed shoulders with the establishment yet tells heretical truths is Daily Mail columnist Peter Hitchens, whose new book The Phoney Victory (I.B. Tauris Publishers) supports Goodson’s case that our textbook histories of World War II lionize the real villains. The most egregious example of a villain-in-hero’s-clothing, Hitchens argues, is Winston Churchill, a bumbling drunken incompetent who stumbled into the wrong war at the wrong time, lost his country’s empire and wealth thanks to an endless chain of terrible decisions, committed some of the worst war crimes of his or any other era, yet is to this day lionized and mythologized by our ignorant and mendacious media. Hitchens’s conclusion is that World War II must be demythologized or we will be condemned to repeat it: “Peace, precarious peace, depends now more than ever on casting off these fantasies of chivalry and benevolence and ceasing to hide the savage truth from ourselves.” Though he doesn’t state it outright, Hitchens must know that the most savage truth of all is the one exposed by Goodson’s History of Central Banking: The real villains are neither prime ministers nor presidents, neither general secretaries nor fuhrers. They are instead the hidden tyrants who dominate and devastate our planet: the international bankers, who orchestrate all our wars in order to tighten their psychopathic grip on our collective throats. Conclusion: The real hero’s journey of our time is the quest to abolish usury.